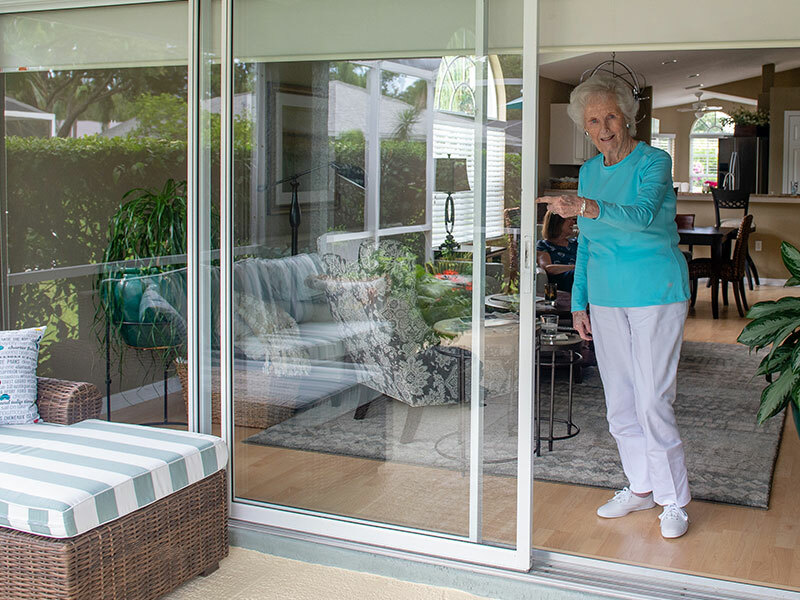 This young lady may look 30 but she is actually 90 + and she can open her slider with one finger, if you can’t there is something wrong with your sliding glass door and time to give us a call. We can quickly and affordably repair your existing sliding glass door in one visit. One call does it all! My door is very hard to open. Why? There are two main mechanisms that effect rolling effort. First, there are rollers on the bottom of each door that may become worn out, corroded or misaligned. Second, upper and lower tracks may become damaged. How do you fix it? How long will it take? 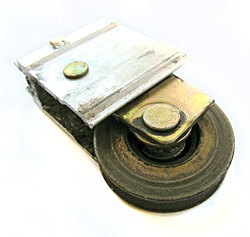 The roller(s) may need to be replaced or the track may need adjustment and repair. This can normally be completed within 1-2 hours. We don’t recommend that homeowners attempt these repairs. Doors must be removed and they are usually very heavy and awkward. If not done properly you can damage the door and then may require an expensive replacement. There are also many different types of rollers that must be precisely matched as they are surprisingly complicated mechanisms. Typically very few rollers are available in your local hardware store or big box retailer. TIP: Do not lubricate these doors with common lubricants such as WD-40 – this will only make the problems worse. My door does not latch and lock properly. What can I do? I can adjust the latching mechanism and door alignment but in some cases a replacement latch is required which is very affordable. Keep in mind that a defective latch is a safety hazard (especially with children) as well as a home security issue. Some homeowners don’t even realize that their door does not actually lock until I show them. I can open the door with some effort, but my children find the door hard to operate. This is a common problem and often leads to further damage to the door when they force the door which can lead to safety issues such as the door being left open or unlocked so the door needs to be repaired as soon as possible. What about age? My home is only a few years old and I am having problems. Is this normal? Many people believe that doors will last 20 or more years before they “wear out.” Unfortunately, that is not the case and I see problems with doors of all ages. Dirt, pool chemicals, pet hair, excess water from rain or landscape irrigation often lead to problems with “younger” sliding glass doors. In addition, many expensive high quality doors even used in the most expensive homes have very poor rollers with bearings that are not sealed or metal and subject to corrosion. We have seen doors less than one year not functioning properly and have upgraded them to premium rollers. Please give us a call so we can discuss your door problems and I should be able to give you an approximate range. Every situation is different and there are too many different doors to list here each requiring unique rollers. 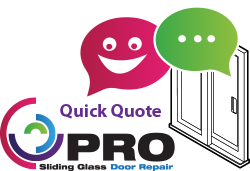 We cannot give an exact quote over the phone, but will be happy come to your home and provide a detailed estimate at the time of service. You will find that our rates are substantially lower than major window repair or glass companies. Our goal is to fix your problem in a professional manner at the lowest cost possible to you – You will not sell you anything that you do not need. Do you install new doors? Here’s what a worn out roller can typically look like. This one came off a door that was only 5 years old. You can see how the bearings have fallen out. Worn or broken rollers can damage other parts of the door assembly, including the track, so addressing the problem early is the best way to avoid costly repairs. There are hundreds of different types of sliding glass doors, each with their own unique set of parts to make them function properly. We service and repair most makes of sliding glass doors and can get them performing to new or near new condition.